England’s defending champion Nick Matthew admitted he was lucky to reach the quarter-finals of the Canary Wharf Classic as the unseen hand of former world champion David Palmer had a massive impact on the PSA World Tour International 50 squash event at the East Wintergarden in London. The Australian, Canary Wharf champion in 2009, is now making a name as a leading coach in Florida. 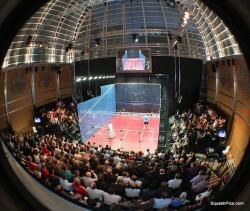 Matthew scraped past one of his pupils, Colombian Miguel Angel Rodriguez, in a thrilling encounter and meets another, South African Stephen Coppinger, in the quarter-finals. 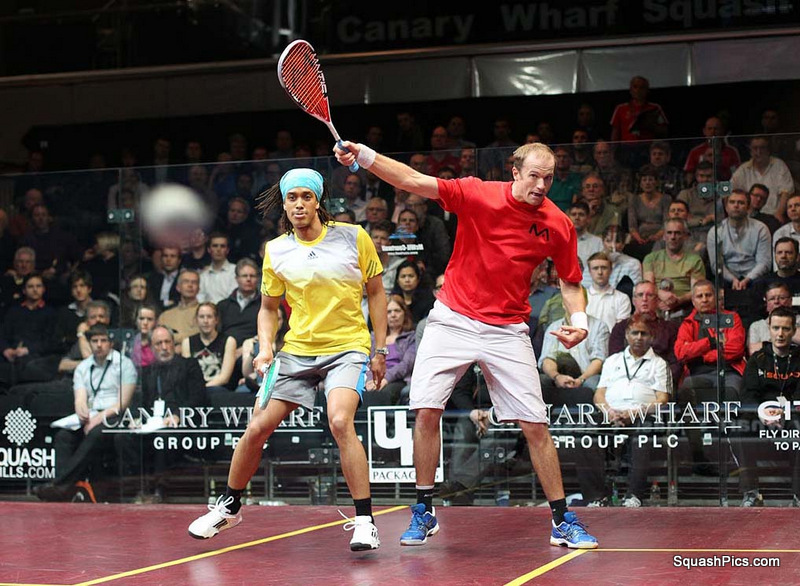 The atmosphere at the packed Canary Wharf venue was more like finals night than a first round as the crowd warmed to the acrobatic athleticism of Rodriguez (pictured in Canary Wharf action with Matthew) in a hugely entertaining battle. The world No23 from Bogota took advantage of some unforced errors from Matthew to win the first game. 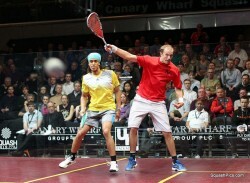 Top seed Matthew tightened up his tactics to win the next three games but Rodriguez battled or every point, pushing the reigning champion to the limit. The fourth game was a brutal battle as Rodriguez flung himself around the court to keep the rallies going and produced some quality finishing at the front of the court. From nine-all, Matthew moved to match ball when Rodriguez failed to scrape a shot off the side wall and the 32-year-old from Sheffield finally clinched a thrilling victory with a crosscourt drop after 70 minutes of sensational rallying. “Miguel was the better player tonight and I was lucky to get through,” admitted Matthew. “I knew what to expect after our massive match in America last year and he has obviously come on a lot since then. 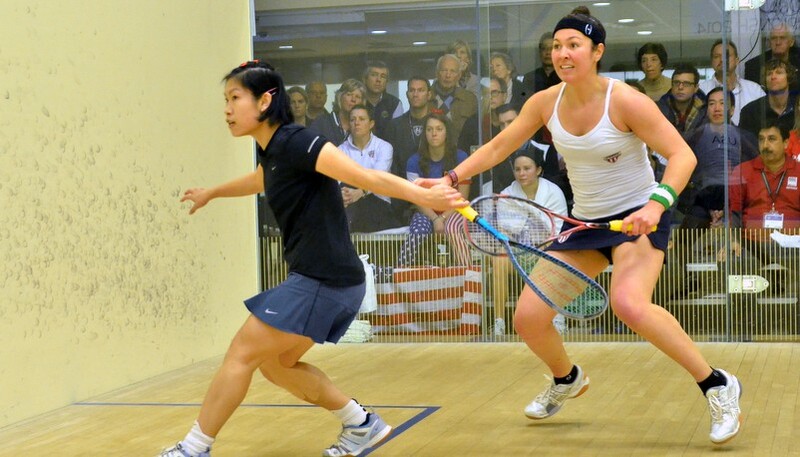 “I was fortunate with a few lucky bounces at crucial times and I am very relieved to get off the court with a win. 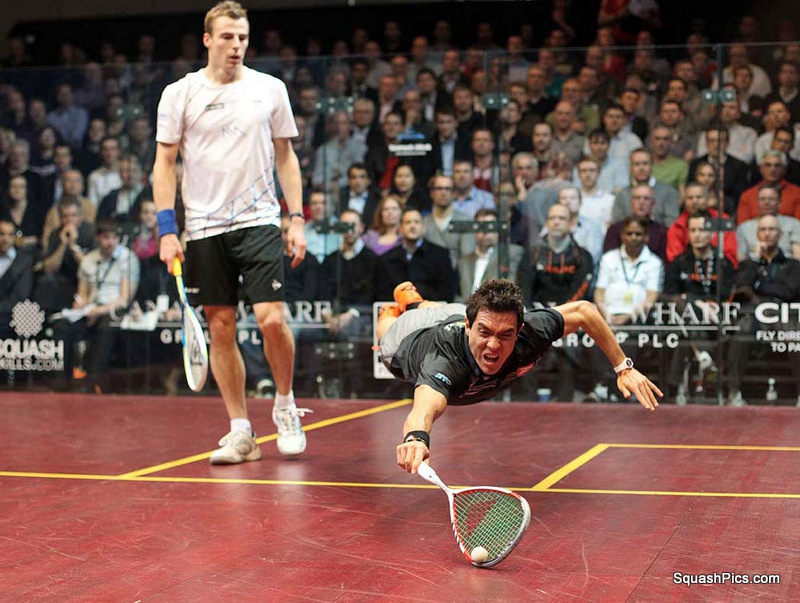 “He is so quick that sometimes you are just not sure if the ball is up or not. 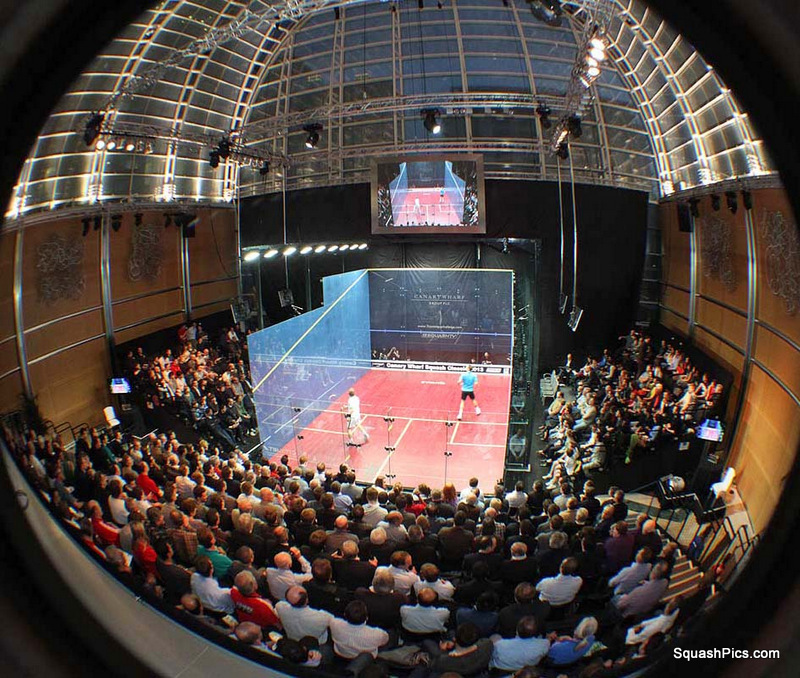 It was great entertainment and very enjoyable for the crowd, but not for me,” added the Yorkshireman who is looking for a record fourth successive title. 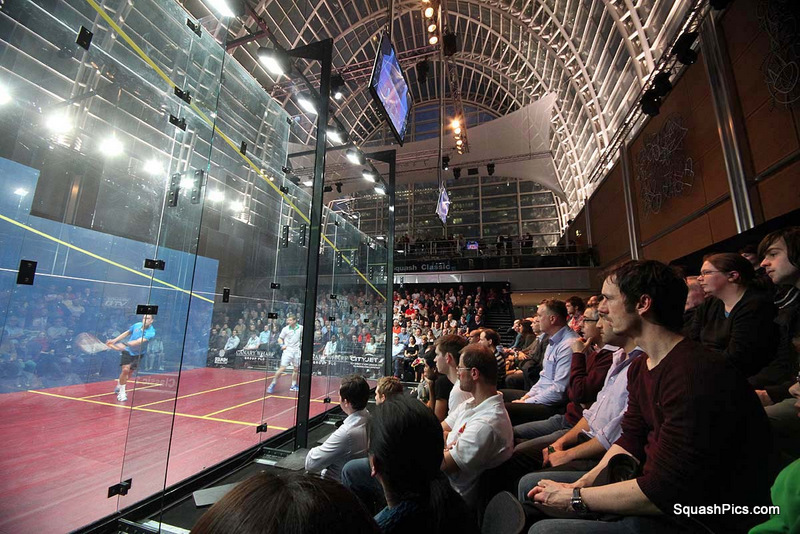 Rodriguez said: “This is my first time here at Canary Wharf and this is a wonderful venue and the best crowd I have ever played in front of. 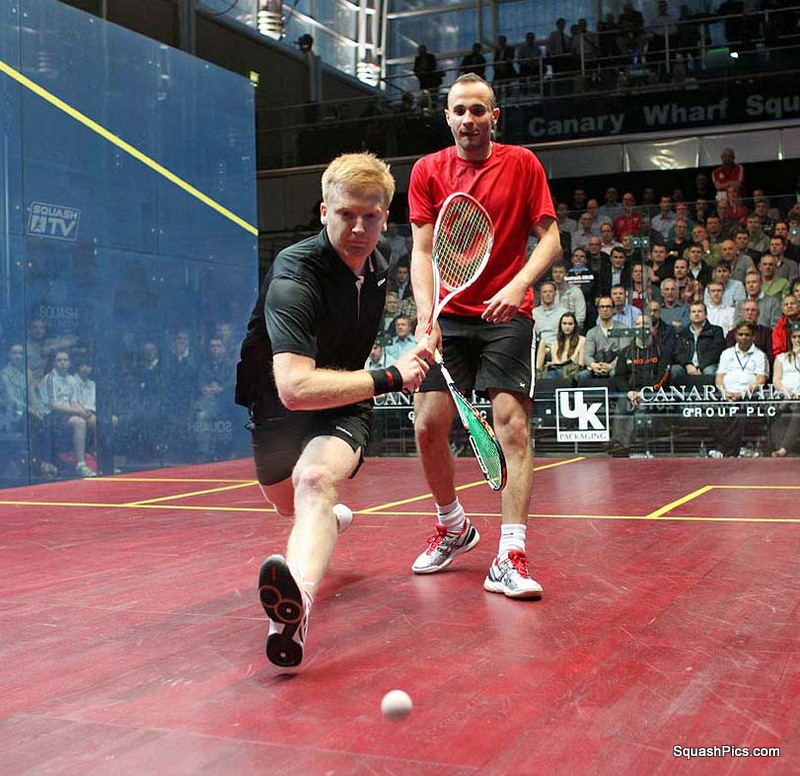 Matthew’s quarter-final opponent, Coppinger, wore down world No14 Alister Walker after two tense opening games and cruised through the third 11-1. He said: “I am looking forward to playing Nick in the quarters and want to thank Miguel for giving him such a tough match. England internationals Peter Barker and Tom Richards meet in the last eight after straight-game wins over Alan Clyne(Scotland) and Mohd Ali Anwar Reda (Egypt), respectively. 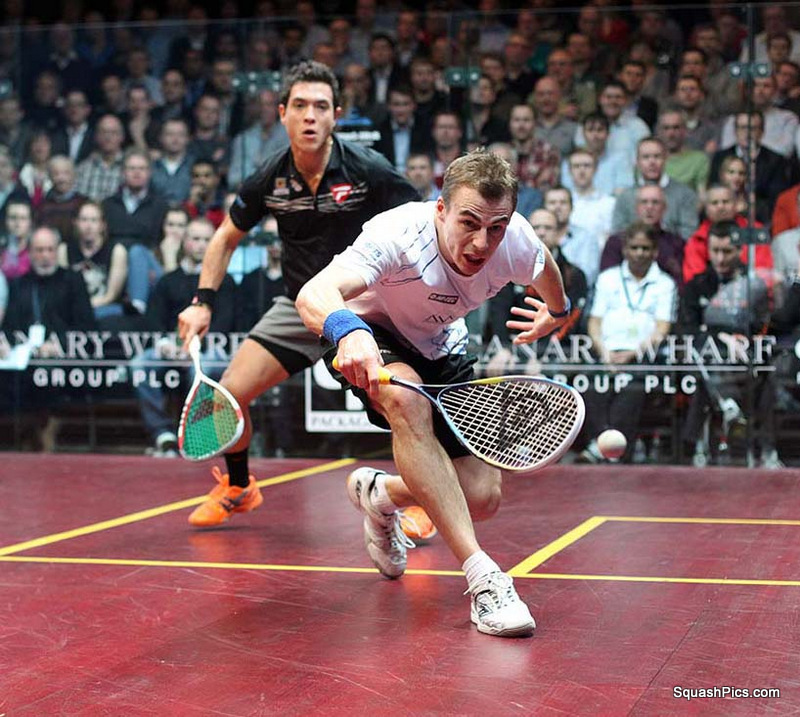 The result could have a huge bearing on England’s squad selection for the forthcoming World Team Championship, with world No8 Barker and No12 Richards ranked three and four in the country behind Nick Matthew and James Willstrop. 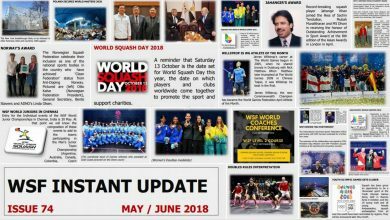 Barker’s knee injury, which caused him to withdraw from last week’s Kuwait PSA Cup quarter-final against Gregory Gaultier of France, was a worry for tournament organisers. But the Londoner dispelled those fears with a demonstration of excellent mobility to overpower Clyne as the Scottish world No.27 made his debut appearance in the London tournament. 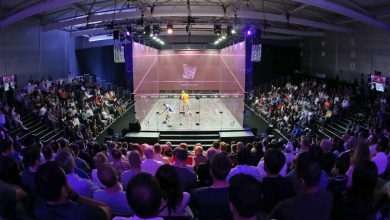 Daryl Selby, who toppled Matthew in Kuwait last week, meets No2 seed James Willstrop in another all-England clash, while Egyptian No3 seed Mohamed El Shorbagy meets qualifier Henrik Mustonen of Finland.